For a while I have been concerned that when it came to the Golden Dawn’s 1=10 grade, the ritual effect was not on a par with the other grade rituals. As I said on Pat Zalewski’s yahoo group, when I went through it there was an empty feeling. The first part of the ritual was the best with the final unblocking of the candidate so that their sphere of sensation could continue up the tree was impressive, but this was nothing like the heavenly canoe rides of the higher grades. I am not talking about intellectual information here. Sure there are spades of intellectual information in the 1=10 which can get the candidate thinking for centuries. But if you want to present intellectual information you give to someone in a book you do not make them sit through a ritual. Rituals are where magic happens, lectures are where you give someone brain food. Then there was the problem of the after effects of the 1=10. They were almost universally bad. The 1=10 is supposed to have an effect on the 12th, first and second houses. This would be a balancing and therefore if a person had a weakness in that area then it could hurt a bit. Equally it could have been positive. With one exception the 1=10 had a negative effect on people’s finances or created a depressing effect on the candidate. This would be fine if the candidate had to realise something earthy, but the fact is the negative effect stopped when the candidate entered the 2=9 so something wrong which was being corrected by that ritual. Being a traditionalist and not wanting to change anything if it can be avoided, I decided to look at the ritual in some detail to see what the problem was. Over the weekend I did two 1=10s and spent some time watching the way the energy flows in the ritual worked. The first problem was in the first half where the ritual tilted towards the Northern element with little to check it. The second part was that there was not enough “divine input” hardwired into the the rite which would have provided the candidate with enough steam to ascend the tree. The problem is no where as acute as it was when I was using Regardie’s 1=10 for initiations. Using Pat Zalewski’s Rituals and Commentaries book we were installing the Archangel Metatron within the candidate at one point which must have helped from the days when I was just using Regardie but there was still something lacking. Likewise there was a lack of the earth element within the ritual. We had also added Hathor to control the forces (at various points she appeared to dance on the altar similar to the Universe tarot card) in the centre of the temple. I found the answer, but I was curious to see if anyone else had spotted it or had noticed any of the same effects. I found the answer in a document written by Mathers but unseen by many until Pat published it a few years ago in his Secret Teachings of the Golden Dawn. This was effectively a Z document for the 1=10. I will get to it in a minute. Anyway the response on the web group was interesting to say the least. Some said they had noticed the same thing and had even changed the ritual to make things work better. Others insisted that the ritual was perfect as it was and I was completely wrong. One suggested that it was earth so it was supposed to be dull, another suggested that intellectual teachings had their place within the system. Perigrin said that crossing the threshold in the temple was an extremely powerful part of the rite. (I could not see how, looking at the ritual dynamic how that could be possible). Generally though the feeling was that the intellectual aspects of presenting the three diagrams were “where the 1=10 was where it was at”. Yet magically (other than impressing the diagrams into the sphere of sensation of the candidate) the impact was limited. Simply the group split between those who felt you could not change anything and those who felt you needed to tinker with things. However, those who felt you could change nothing had to argue their position from the perspective that it was perfect in the first place and those who wanted changes often wanted to shift it towards their own bias. Now as usual the answer lay in between (ironic for a 1=10 debate) Only one person thought to suggest that I look at Mathers’ ritual explanation. Mathers suggested that in the first part of the ritual there was a triangle of invisible godforms formed in the temple. 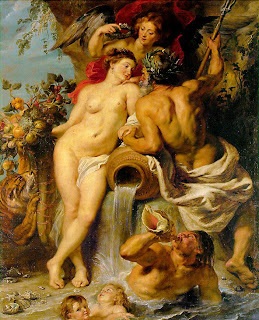 In the East there was the godform of Adonai Ha Artez (although he did not say it would be under the control of the Eastern Tablet and its Elemental King) In the South there was the female form Malkah (the bride) and she was under the control of the King of the Southern Tablet. The North was under the control of the Godform of the King of the Tablet. Although Mathers did not explain the idea much this triangle of force would balance the ritual completely. Firstly the polarity between Malkah and the Elemental King of the North would create the immeasurable region and this could be controlled by Hathor to allow the candidate to enter. Crossing this would give the candidate a burst of energy as they stood between the two polarities of Malkah and the Elemental King. Malkah’s energy would be controlled by the Elemental king of Fire which would make her power more fiery and warm up the darker side of the elemental King and the tablet. This would be something that would be controlled by Hathor who, as the God of Love and Beauty would counter effects of depression. The colder aspects of Earth would be warmed. This is emphasised by the fact that the triangle which the earth is connect to the three godforms is a fire triangle. The Apex of the Triangle is Air which is the opposite to Earth. This brings spirit into the ritual through the Air element. 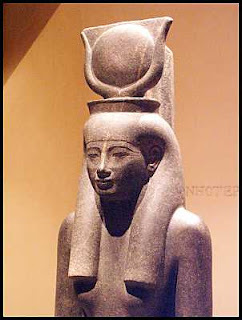 To balance this Hathor would have to rise above the altar (like in key 21) to form a pyramid (of fire). 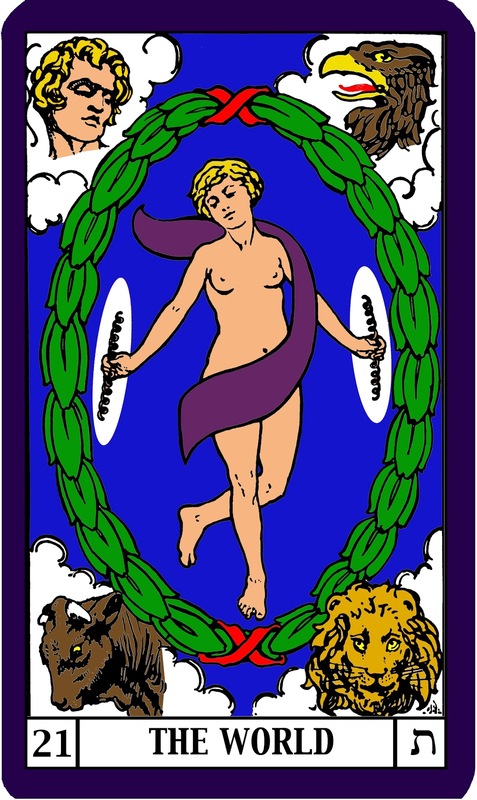 But it creates a three dimensional triangle of the art wherein the Heirophant can bring Metatron inside the candidate to provide them with the spiritual power to continue up the tree. Notice how much fire is in this part of the ritual? Hathor is likewise a fiery aspect. All this serves to balance the Earthy energy invoked by just opening the Earth tablet. So why didn’t Mathers balance the Earth energy with its opposite of Air? The effect would be to cancel out the Earth energy. In his other papers Mathers says that Air and Earth, on its own creates some weight, makes things difficult to see, untangible and provides little motion. Not a great thing for future work. Fire and Earth, on the other hand creates great dryness and slight obscurity, perfect for future effort. Air would increase the power of the Fire to create great heat, intense lightness, and motion which would be balanced from getting out of hand by the Earth. Either way the combination would help the candidate move on with some clarity. So why no water? Water, according to Mathers would only provide some slight effect on the fire but speed it up too much, but it would have the effect of making the earth too cold, too heavy, dense and solid. So what was going wrong with the Regardie version? The candidate comes into the temple and gets hit by pure Earth which was cold, dry and heavy and solid. His first encounter is with Samael who stands by the Water side of the altar and represented by an officer connected to Water. He fails, and goes to Metatron who is on the Southern side but is not supported by a fiery polarity of Malkah and the Elemental King of Fire. The Air element makes little, or no energetic appearance in the ritual, thus the candidate is hit by an unbalanced Earth Element with no control or balance and becomes unbalanced in the Earth element for their time in that grade. If the person is already unbalanced then they will suffer badly. Since most people are unbalanced when it comes to their finances they get hit there. If not they get hit by the heavy Saturnian nature of the Earth and this leads to depression. There is nothing positive to be found in unbalanced Earth. It is all pretty grim. It also ends when the person gets into the 2=9 when they finally get the balance of the Air (the 2=9 has a strong foundation and balancing aspect). What is tragic is that the paper that Mathers gave his hint was given out at the highest grade of the 5=6 in the early Golden Dawn, but not seen until the 6=5 in the Stella Matutina. Few copies have turned up and few knew about them until Pat published his book. It is not clear if this will solve all the issues of the 1=10. I am not sure if the more passive invisible stations of Malkah/ Fire are strong enough to polarise a fully open tablet in the North and the candidate would be unaware of either of them. I would suggest some direct exposure to those forces might be needed (perhaps allegorically telling the candidate of their existence). However Mather’s changes would go a long way to balancing the problems I have this this ritual. No-one has commented on this. So I will. Your discussion of this has deepened my understanding of this ritual and especially the invisible stations and energies within it. 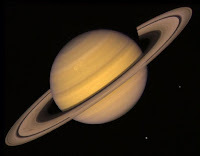 The balance of energies that Mathers discussed here – through the godform of Hathor, etc., – that you refer to makes sense, and I now believe needs to be visualized properly during this ritual so as to prevent imbalance within the candidate. At first I didn’t get this, but then, when I contemplated it, I saw this balancing out of energies occurring also in the other Grade Rituals such as 3=8 where the paths of Fire come first before the Sphere of Water, and vice-versa in the 4=7. I also believe that the admission badge of the Fylfot Cross, essentially a firey/solar symbol, invisibly on the floor (as Pat Zalewski has mentioned) is also an aid in bringing in some Fire to energise and warm up an otherwise heavy, cold earth energy.There is so much more we need to learn about this Ceremony.